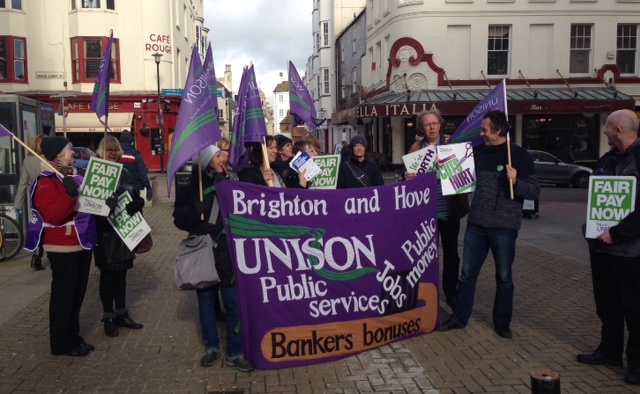 Brighton & Hove Local Government Unison members joined others up and down the country on Tuesday, 4th February in a day of protest over pay. Local government workers are amongst the lowest paid in the public sector. For four years they received no pay rise at all, and last year were given a measly 1%. The government wants the employers to cap any rise this year at 1% again. This means that council staff have seen their pay shrink year on year while inflation and price hikes on things like heating costs have risen steadily. Hundreds of thousands of jobs in local government have also been axed as councils try to cope in the face of Government cuts, leaving the remaining staff with ever-increasing workloads as they struggle to maintain valuable services, from social care to collecting the rubbish.